This past week has been a rough one with the death of two beloved pets! 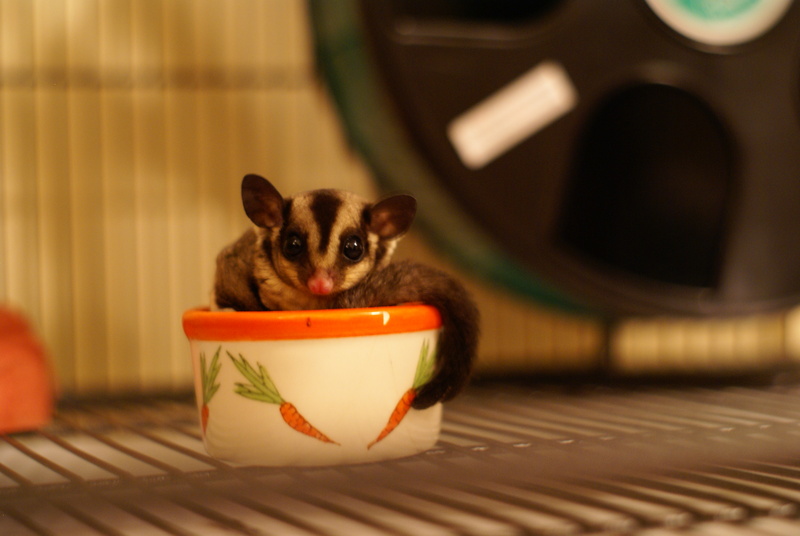 About a week a ago we came home in the evening and my oldest son found one of his two sugar gliders, Bailey, dead in the cage. It was really sad! Then, four days later my parents took the older three to see a movie and when they returned home their cat Kit was at the front door with completely paralyzed back legs. It turns out she had a stroke and had to be put to sleep. Both Bailey and Kit were loved and are now greatly missed. But this is an unfortunate reality when you have pets; they are so much fun to have and love but you do have to deal with death quite a bit. We have dealt with this a lot because, really, our house has become a zoo. My husband and I started our marriage 16 years ago with two cats, Jessie and Wyatt (they’re still alive at 17 years old!). They were our first “children” as what often happens with pets, pre human children. We talked about them, I have lots of pictures, they laid with us on the couch each night, and, don’t judge, but we even bought them catnip stockings at Christmas. For awhile we had a third cat named Billy who was very cute but not the smartest animal in the world. One day he went outside and we never saw him again! Then our first child Aidan came along and he was an animal lover from the beginning. From birth he loved ducks! For years he begged for a pet duck but luckily we moved past that one. His duck obsession moved to birds and we spent one winter counting backyard birds to report back to Project Feederwatch. From there it grew into a love of all animals and by all I mean ALL. Not just the cute furry tail wagging types, but also the small and slimy. And so my house as become a zoo with animals rotating in and out depending on the season. We have had ant farms, sea monkeys, walking sticks, praying mantises, lightening bugs, spiders, more fish than I can count, turtles, lots and lots of frogs including a tree frog that would start peeping in the middle of the night, a guinea pig, a mouse, an injured bird, a bunny for a few hours, and salamanders. Of all of these animals, it is the salamander that I greatly dislike. Outside, oh wow look a salamander, inside, no. They have been banned from the house! 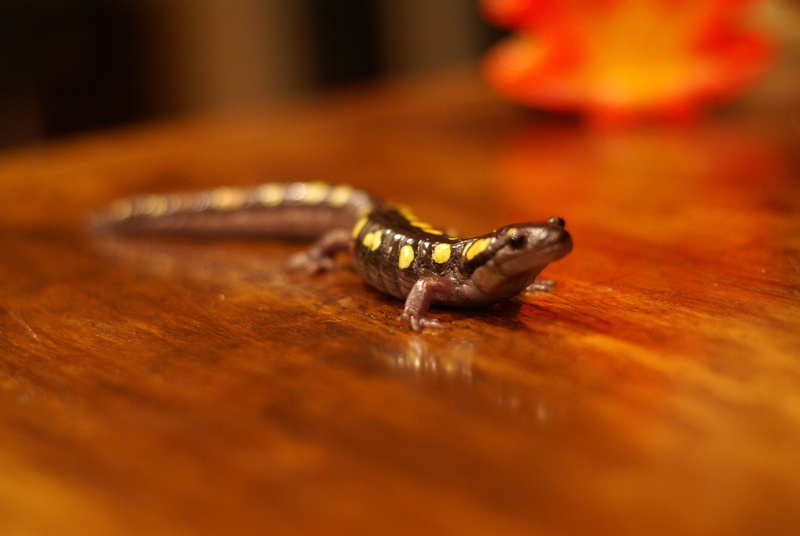 The first salamander my son caught he put in his glass aquarium. The smelly, slimy thing ran all over the aquarium and then just stared at me. I knew it was bad news but because my son was so excited, I told him he could keep it for a few days. The next morning my husband woke up, went downstairs, and there was the salamander in the front entryway. Yuuuckkk! The thing had managed to climb up the aquarium, off the dresser, over the carpet and out my sons’ room, down the hall, down the stairs and into the entryway! All I could think of was what could have happened as in waking up to find a salamander in my bed! 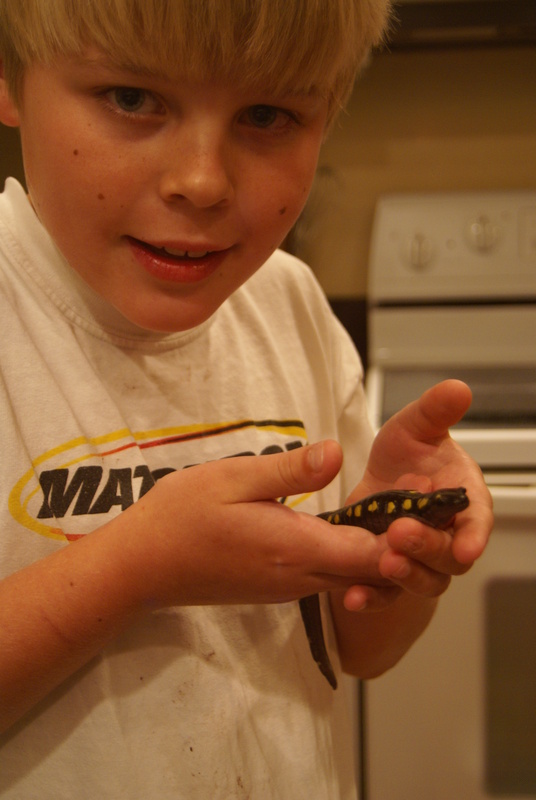 "the biggest salamander I ever saw"
A few months later my son again brought home a salamander. This was “the biggest salamander I have ever seen” according to my son. My younger son and husband were excited too. But, I have a good memory when it comes to slimy amphibian crawling around my house at night so I told him he could take some pictures and let it go. My husband and sons had some fun taking pictures and then it was gone. Heather, this is hilarious! I have a great fear of something creepy coming out of the pipes to scare me – glad I’m not the only one! Exactly! So scary to think about! OH Heather! That salamander accident would freak me out forever.Love your writing.